Hiking in the UK is one of my favourite hobbies. And with many National trails and day hikes you can do all across the UK you have plenty to choose from. The more hiking I do in the UK the longer my list of walks is. 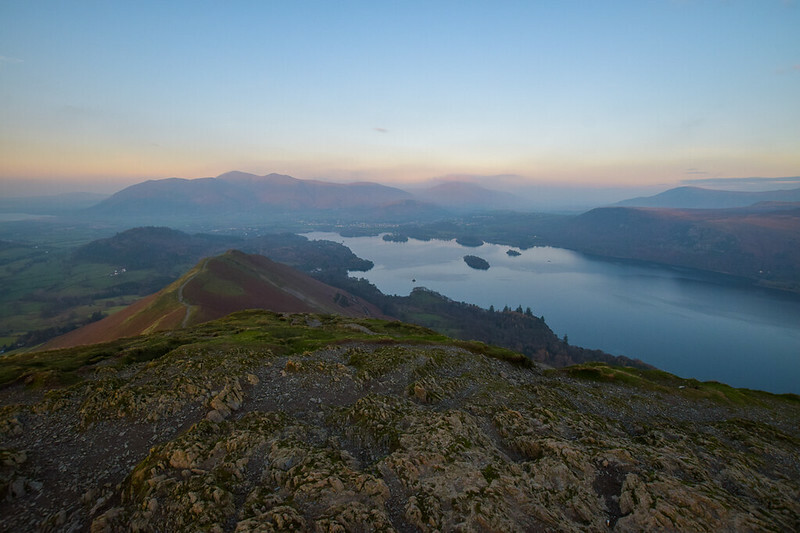 With 15 gorgeous UK National Parks, we really are spoilt for choice with where we can go hiking. Here’s a list of gorgeous hikes from around the country to tempt you to go outdoors and explore more of the UK. I’ve included some of my favourite walks but I’ve also asked my fellow hiking travel bloggers where their favourite places are for hiking in the UK. Is your favourite day hike in the UK on the list? If not tell me what is your best walking trail is in the comments! One of the most popular hikes in the Lake District National Park (and England) and you quickly realise why as soon as you start hiking. From the start point at the Outdoor Centre it takes just over an hour to reach Catbells summit. Take your time though because there are amazing views on both sides, in front and behind you. An excuse to keep stopping to catch your breath to look around. Once at the summit, you can really take in the scenery of the idyllic Lake District. Even with the sun setting in the photo above you can see how beautiful it looks. Recently voted as the third best walk in the UK, Malham Cove in the Yorkshire Dales National Park is a great day hike for everyone to enjoy. It’s a relatively short walk in England that you can complete in a couple of hours. Depending on how many times you stop to take photos. The Cove is a huge cliff, very popular with climbers in the UK. And the hike takes you right along the top of the cliff edge for some stunning views (on a clear day). You can then hike in a loop, stopping at other landmarks on the way. Gordale Scar is a short extension that you can add to the hike. It’s a flat there and back route but worth visiting if you have the time. It’s a perfect place to visit for a walk as a day trip from York. My highlights were walking towards Malham Cove and looking up and realising how high the cliff is and then 10 minutes later being on top with gorgeous views. 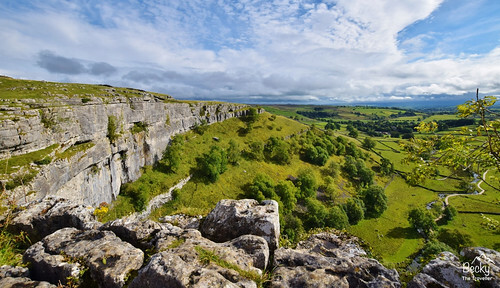 This is a popular day hike in the Yorkshire Dales, it’s best to visit on a weekday. I would recommend doing the loop in a clockwise direction so you have the spectacular moment walking towards the Cove. You then hike along the tracks of the old railway, part of the UK’s industrial history of this area. Over centuries Rosedale produced ironstone and sandstone. Used in many buildings around the local area and wider in the UK. And over a period of about 70 years, there was over 13 million tons of ironstone mined from the area. 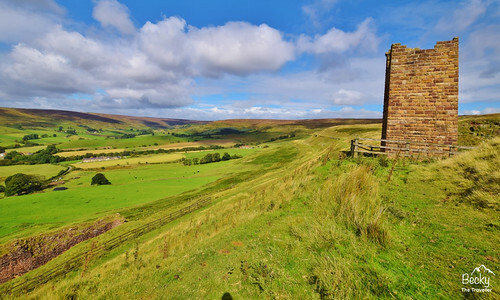 Climb up to the top of the kilns to get a view from the top and to explore the tall chimney high above. St Agnes’ Trail winds around the Cornish coastline in the west of the UK. Between Perranporth and the little village of St Agnes, that passes through historic mining sites and dramatic cliffs. It’s a relatively flat and easy day hike at 3.5 miles long, with a few steep climbs. It’s best to start the hike in St Agnes. This means the most striking views are all ahead of you as you walk. Once you reach Perranporth, fork left after the ‘Youth Hostel’ sign to go straight to the beach. There you’ll find the ‘Watering Hole’, where you can refuel while listening to the sound of crashing waves. To get back from Perranporth, you can either double back to St Agnes on the same trail. Or catch one of the buses running regularly between the two towns. Plan on taking around three hours to complete the hike. And also make sure to bundle up warm. The wind whips in straight from the sea. Often making it feel much colder than further inland. 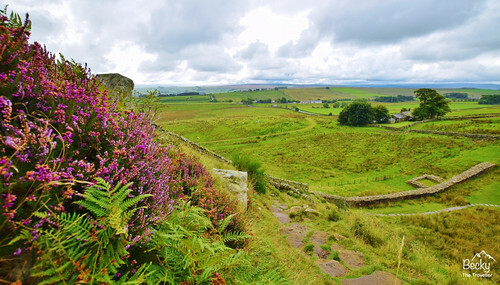 Hadrian’s Wall can be hiked as a day hike or you can do the entire long-distance walking trail which stretches all the way across the UK. I hiked the trail a few years back over four and a half days, all 84 miles of it! But for those who still want to see this amazing UNESCO Heritage Site, there are plenty of day hikes you can do to see the historic wall in all its glory. This day walk starts at ‘The Sill’ a new visitor centre, café and hostel all in one! Park your car here and within 5 minutes you are walking along Hadrian’s Wall. This part of the hike the wall is well intact and because you are up high the views around are beautiful. It is particularly beautiful as there are remains milecastles and a bit further along the crag where there’s a sheer drop into a body of water. For a day hike, you have two options. You can either walk there and back along the same path. Or option B is to head down from the path and hike back along the path that’s parallel to the wall. A great option as you see Hadrian’s Wall from a completely different perspective! The Jurassic Coast is 95 miles of England’s first natural World Heritage Site. If you don’t have time to hike the full trail then one of the highlights of the Jurassic Coast is Durdle Door. 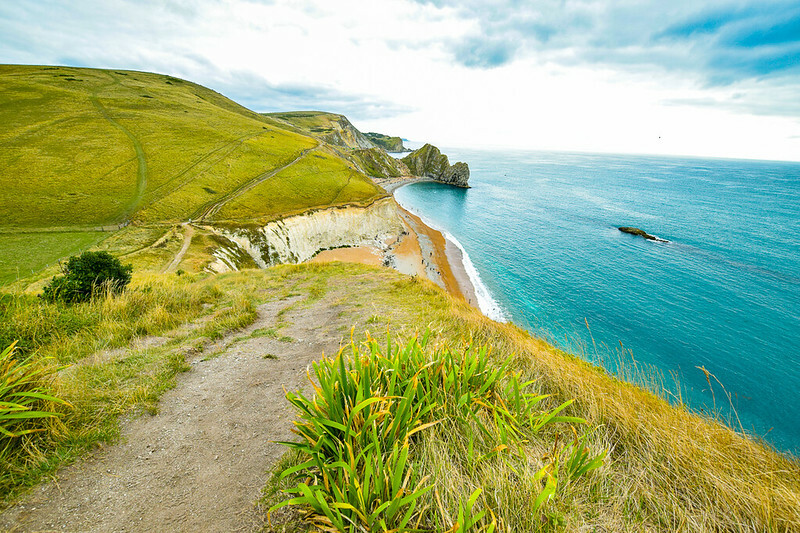 You can park at nearby Lulworth Cove then enjoy the coastal walk along to Durdle Door. Since the National trail continues in both directions you can extend the walk or shorten it, whichever you prefer. The trail is part of the UK’s longest long-distance walk, the South West Coast Path. The walk along the Jurassic Coast is stunning and you can capture some beautiful photos. I hiked along the 95-mile coastal path over five and half days but Durdle Door and the stunning white chalk cliffs were a real highlight of the walk. If you have more time then I’d recommend hiking further and you’ll see some wonderful views. Durdle Door is a popular spot and can be busy during the summer months. Go early in the morning or visit in spring or autumn. I wanted to visit the iconic Seven Sisters cliffs in the South Downs National Park on the south coast of England ever since I moved to London. It is an easy day trip from London, a train to Brighton then a bus to the ‘Seven Sisters Visitor Centre’. There are several day hikes to take in the area, including walking on top of the cliffs. And although it’s not difficult to navigate as you mainly follow the cliff path, it’s useful having an OS Map to plan your route. I enjoyed the walk along the cliffs looking out to the sea admiring the beautiful scenery around. After about 4 miles, you reach Birling Gap where you can stop to enjoy some ice cream from the cafe before continuing to ‘Beachy Head. From the top of the cliffs, you can see down to Beachy Head Lighthouse. And if you are feeling energized you can hike all the way to Eastbourne. The day hike from the Seven Sisters Visitor Centre to Beachy Head is about 6 miles on easy terrain, with a couple of steep climbs to get up onto the cliff path, a popular hike in the UK! If you get tired or want to shorten your walk. There is a good bus service between Brighton, the Visitor Centre, Birling Gap, Beachy Head and Eastbourne. So you can easily get back to your car or train station without retracing your steps. A day hike on Dartmoor, southwest in England can take you through neolithic settlements, past stone circles and into ancient forests. One place that’s filled with history and legend is the mysterious Wistman’s Wood. And makes for an easy but rewarding hike through heath and moorland. Wistman’s Wood is a stunted oak forest, which means none of the trees grows higher than about 20 feet. It’s believed to be the last remaining part of an old forest that once covered Dartmoor. As soon as you enter the forest, you feel as though you’re in a different world. The floor is strewn with boulders which tumble-down to the river below. Small paths weave in and out of the giant rocks, and lichens and moss hang off the twisted and gnarled oak branches. It’s easy to see why the wood is believed to be home to pixies and elves and was supposedly an ancient Druid’s grove. Worthy to be on any best walk list in the UK. To reach the wood, park opposite the Two Bridge’s Hotel car park just outside of Princetown, Dartmoor. A wooden sign at the gatepost reads ‘Wistman’s Wood’. Follow the path past golden gorse bushes and a working farm, before it opens out onto moorland. To reach Wistman’s Wood shouldn’t take more than an hour then allow at least an hour for exploring some of the 9 acres of woods. You can extend your day hike to the nearby Longaford Tor. A 45-minute hike for 360-degree views of the surrounding landscapes. It’s a beautiful place to hike to at sunset when the evening sunlight turns the forest floor into gold. One of my favourite day hikes on my UK National Park challenge was climbing Scafell Pike. It is the highest mountain in England at 978 m/ 3,281 ft, in the UK’s beautiful Lake District National Park in Cumbria. This hike came third in the public’s best hikes in Britain poll. There are many routes you can take to the top, some more challenging than others. I opted for a circular route, from Wasdale Head, hiking up via the Corridor approach route and back down the Hollow Stones path. I love to see and experience the different scenery when I’m hiking! From the car park, it’s about 3 km to the start of the Corridor route. And from there it’s another 3 km to the summit. You hike past ‘The Great Gable’ and there’s a short section where you have to scramble along the route. The hike takes about 2.5 hours up. My highlight was reaching the top to have 360-degree views of the fells and lakes around me. The views of Lake District National Park are absolutely breath-taking on a clear day. The hike down via Hollow Stones is much easier to navigate and is the most popular route. From here it’s about 5.5 km back to the car park. And takes about 2 hours. Although the views are just as gorgeous on the way down on one of the best walks in England so be sure to keep your camera out. Don’t even think about trying this walk without a map and a compass. Some parts are easy to navigate but there are also a few paths that try to lead you off in the wrong direction! 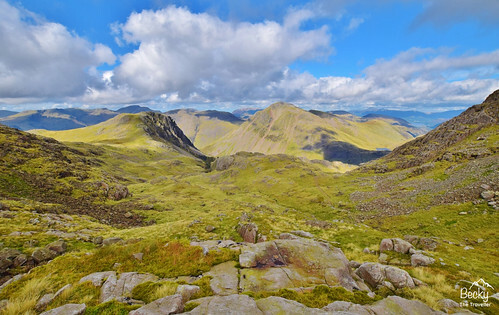 Read next: Which hike is best Scafell Pike versus Helvellyn in the Lake District? I loved the last section of the UK North Downs Way. It is a well-signposted hike from Etchinghill to Dover. And easy to reach with public transport, via Sandling station, so you have no excuse not to go and see this prettiness! The distance is around 20 km. It took us close to 5 hours, but we included plenty of breaks and photo stops. Large sections of this route follow the top of the North Downs. So you will be treated to some stunning views of Kent’s countryside and the White Cliffs of Dover. Highlights for me include walking through meadows that smell like roasted garlic near Etchinghill. I like the interesting, although slightly industrial, views looking down from Peen Quarry to the channel tunnel. Then once we got as far as the White Cliffs, you could see stunning scenery all the way to Dover. This walk is perfect for viewing a green, wild-flower-covered view of Southern England. As well as the natural beauty, I loved seeing so many varied historical sites. We walked past WWII pillboxes, an iron age fort, a Battle of Britain Memorial, a giant acoustic mirror, a Knights Templar church, the Drop Redoubt (a fortification built in 1805) and of course, Dover castle. Wear leggings or trousers! I hiked in a skirt but spent lots of time dodging stinging nettles. Walking along the River Dove, it’s relatively flat terrain at first, with a few muddy spots if it’s been raining! The famous Dovedale Stepping Stones are only a short distance into the hike. But be prepared to wait a little while during peak times as people will be waiting to cross. The path then takes you along the river and you can do a circular walk through fields and back to Dovedale car park. Take change for the car park. And also money to buy an ice-cream on a sunny day! As one of the best hikes in the Peak District, it’s also very popular too so visit mid-week if you can. With 26 miles (42 km) of walking paths and trails, the Mourne Mountains in County Down, offer spectacular landscape panoramas of Northern Ireland. From low-lying pastoral land to snow-capped mountain peaks, you’ll see it all hiking along these paths. Steep trails do exist, but the area boasts walking trails for all levels, from beginner to enthusiast. One of the most distinctive features of many of the trails is the ‘Mourne Wall’ running along the summit of the range, connecting 15 mountain tops. Completed in 1922, it was built to keep cattle out of the water reservoir below. Although there are 10+ trails to choose from, my friends and I headed out from Belfast to conquer the 7-mile Slieve Binnian trail. Located in the High Mournes, the Slieve Binnian trail is a circular path that can be completed on a day hike. Ascending between the South and North Tors before it heads back down past the Blue Lough and Annalong Forest. What may seem like an easy hike at the start becomes more stringent the higher you climb. Utilizing both your hands and feet to scale boulders to the top. But once you get to the top be prepared to be amazed. The views of Northern Ireland from up here is nothing less than magical. If the weather is kind, you can even see Scotland in the distance! A pretty epic hike in the UK that needs to be on your list! Tollymore Forest Park is one of the more leisurely, but more scenic day hikes in Northern Ireland’s Mourne region in the UK. Hiking the ‘Mourne Mountains’ and ‘Tollymore’ are often coupled together on a wider walking itinerary. So Tollymore Forest Park shares a range of hiking options, each led by different coloured waymarker arrows. The favourite would undoubtedly be the ‘River Trail’, which follows the Shimna River through both conifer and broadleaf woodland. Along the way, highlights include the Hermit’s Cave, a stone hermitage built into the edge of the river gorge. And Parnell’s Bridge, which is the last of the old stone bridges found in the forest dating back to 1842. It is also possible, and fun, to criss-cross on each side of the river by various bridges and stepping stones that cross the river rapids at various points along the way. The forests are also home to various wildlife including red squirrels and the occasional wild deer. As with many of Northern Ireland’s scenic landscapes, Tollymore Forest Park is now well known as the setting for various scenes of Game of Thrones and included on itineraries. There are gardens, picnic facilities and camping areas located at the main entrance to the park. This is located in the small village of Bryansford, just a short drive (or bus) from Newcastle town. The Old Man of Storr is probably the most photographed landmark on the Isle of Skye. Connected to the UK by a bridge off the northwest of Scotland. We visited in August, which is peak season. To avoid the crowds and get a special atmosphere we decided to hike it at sunset. It was a great decision! In fact, no one else had the same idea that day! We set off at 8 pm from the parking lot. The trail is quite obvious, we had our Explorer 408 OS Map but didn’t end up using it. It took us 45 minutes to hike to the top without stopping. The weather was great, no rain at all, which is practically a miracle in Scotland. We enjoyed looking at the orange sky and watching the sheep grazing. After sunset, we walked back along the trail to our car. On the way down the moon appeared in the sky making our evening even more magical. Try and avoid peak times to visit as the parking lot can get full really quickly. This is a stunning but easy day hike across 5.25 km of fairly flat terrain. The walk takes you on a round trip through Rockcliffe and Kippford, two pretty seaside villages in the beautiful Dumfries & Galloway region of South West Scotland, UK. The route is easy to navigate without a map and there are signposts on most gates. Start off at Rockcliffe beach car park, where you’ll find an ice cream van. It’s mandatory to buy one whatever the weather! At Rockcliffe, you’ll see ‘Rough Island’, a haven for seabirds. And the beach is covered with seaweed and rockpools teaming with life. By the ‘Welcome to Rockcliffe’ sign, you’ll see a path heading into the woods. Follow this past some beautiful houses and through two sets of kissing gates where it opens up into meadows. Go over a cattle grid and past some Victorian houses that overlook the estuary. Down an incline, you’ll see a boulder pointing you towards Kippford. The path eventually splits. Take the left one going downhill. You’ll arrive at Kippford beach, one of the most beautiful shell beaches in Scotland. After a look round, follow the road towards the village, going past some interesting creatures watching you from the trees! These were made by a local artist from driftwood and stones. Arriving into Kippford village it’s full of quaint cottages and a tea room if you need a break. Then it’s time to follow the road onto the Jubilee Path, which will lead you back to Rockcliffe via amazing coastal views. The Water of Leith is my favourite day hike in the UK. Starting in the bucolic southern suburb of Balerno, the trail follows the eponymous Water of Leith River all the way to ‘The Shore’, in the north of the city. You can buy a map at ‘The Water of Leith Visitor Centre’ in Longstone for £1.50, or from the official website (link above). Although, it’s a well signposted and a straight path, so you don’t really need one. To reach the path take the No. 44 bus from Edinburgh. The path starts at Balerno High School and stretches for 19.6 km/ 12.25 miles. Some sections run adjacent to roads, but the majority is along peaceful woodland trails. During the walk, you’ll spot plenty of dog walkers, cyclists and (if you’re lucky) the famous heron. In the city, you don’t often see wildlife, so it’s super exciting when you catch a glimpse of him! The section from Balerno to Slateford is along the old Caledonian Railway line. There are no visible tracks, but you walk through the Easter Hailes Gate railway tunnel. The trail winds its way through the heart of Edinburgh, and during the hike, you’ll walk through parkland as well as forest. Keep walking until you reach ‘The Shore’ – Edinburgh’s answer to Nyhavn. To return to the start, take the bus (number 22, 16 or 7) to Princes Street. Then hop on the 44 back to Balerno. Tickets cost £1.60. ‘The Shore’ is about 15 minutes by bus from the city centre, so if your hotel is in central Edinburgh you finish close to where you want to be. There are plenty of opportunities for extra sightseeing on the day hike. You can visit the winter gardens at Saughton Park, pop into the Scottish Gallery of Modern Art near Dean Village or take a little detour at the Royal Botanic Gardens. 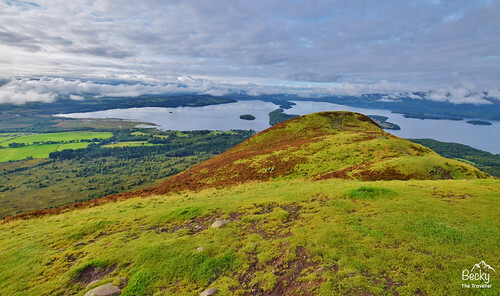 If you like day hikes that give big rewards for little effort, then the Conic Hill in Loch Lomond is the hike for you. This 2.5-mile hike takes most people about 2 hours to do but offers stunning views of the gorgeous Loch Lomond. Undoubtedly, the highlight of this hike is the view from the top where you can appreciate the vastness of the Loch and see all the little islands inside it. The hike is popular with locals and day-trippers alike and you’ll probably see a lot of dog walkers on your way up. As well as this, it also serves as part of the West Highland Way; a multi-day hike that runs from Milingavie to Fort William. You’ll start the hike at Balmaha, a small village on the banks of Loch Lomond. If you’re lucky enough to visit on one of Scotland’s rare sunny days, it’s possible to take a ferry from Balmaha to some nearby islands after your hike. If the weather’s not on your side, don’t worry. It’s the perfect excuse to grab a cosy whisky by the fire at the Oak Tree Inn, a popular restaurant that’s strategically positioned at the bottom of this best hiking trail. Scottish mountains may not be very high, but their beauty and wilderness give them a unique feel. The same goes for Suilven – a mountain of 731 m, located on the west coast of Scotland, in the Assynt region. Thanks to its remoteness, stunning views and interesting shape, it can easily be called one of the finest hills in the UK. The day hike to the top of Suilven starts at the end of the public road from Lochinver. In the middle of the walk, there is a very nice bothy, you can stop for a break or even stay overnight. Bothies are small cottages hidden in the Scottish mountains, very basic, but free and open to everybody. It’s a perfect place to feel the real climate of Highlands. It involves a bit of scrambling and steep ascent but generally is not very difficult. From the top the views are stunning and I can highly recommend this hidden gem to every hiker! Make sure you pack the right gear and are well prepared for the weather as it can change very quickly in the mountains (and in the UK). 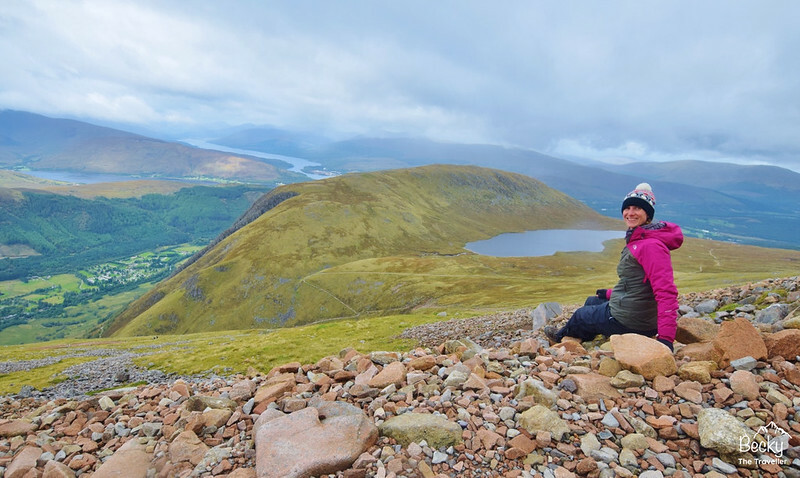 Ben Nevis is the UK’s highest mountain at 1,435 m/ 4,413 ft. It’s a tough day hike but still achievable and it’s why it’s on my best hikes list. There are many hiking trails up to the summit but the Mountain Path is the one for novice walkers (other routes require specialist equipment). After walking from my campsite nearby then starting from Glen Nevis Visitor Centre with a few greys clouds loitering around I was soon putting my waterproofs on. The temperature was around 10 C degrees, which is useful to know, at the summit the temperature can be at least 9 degrees colder. The Mountain Path is a relatively easy path to navigate through the first section, although I still used my OS Explorer Map to check my progress along the route. It takes between 3.5 to 5 hours to reach the summit. The hardest and most difficult section to navigate is the last section where you can use the cairns to help guide you. But it’s really important to have a map and a compass too (as with all hikes in the UK). There are some huge drops on the North edge (611 m/ 2,000 ft) so you don’t want to get too close. The clouds were clinging to the top of the mountain so visibility was reduced to only 50 m but I made it to the top and had the standard summit photo! On the route down the clouds cleared and I was treated to some beautiful views out to the ocean. Although the route down is supposed to be quicker (1.5-2.5 hours), it took me longer as I stopped to take so many photos! Be prepared for all weather conditions and have extra layers to put on at the top! Bring all your litter back with you. Take responsibility for keeping this mountain a clean and beautiful place. My favourite day hike in the UK was a memorable hike from Ullapool to Rhue Lighthouse. The previous day we’d done Ullapool Hill and got some great views from the top, but we wanted to do something a little different. The local iCentre recommended we hike the coastal path from Ullapool to Rhue Lighthouse. The walk was 7.5 miles (3.75 each way) and rugged. I’ll say! Initially, the walk starts out as a beach walk, taking in the lovely stony beach and blue water of Loch Broom. We stopped for lunch at a beached boat with some gorgeous views. The further we hiked the more rugged the walk became until we were scrambling across rocky headlands, climbing over fences and trudging across very muddy farmland. Several times there was no visible path, and we found ourselves following the fence/coastline North, which made it feel really adventurous and off the beaten track. We saw very few people along the way. Eventually, we found the beautiful little lighthouse, which was really sweet. For me, though the journey was more rewarding than the destination, the hike was tiring, muddy and at times challenging (fording some of the streams was interesting!) But ultimately it was a beautiful walk and worth the effort. To top the day off, on the return journey we spotted a seal frolicking in the Loch beside us, who seemed to follow us all the way back to Ullapool. So lovely to see nature at its best! Pen y Fan is a great day hike you can do in the UK. Situated in Wales in the Brecon Beacons National Park it’s the highest summit in the south of the UK at 886 m/ 2,907 ft. There’s a lay-by at Pont ar Daf where you can park and see the summit straight away (on a clear day). 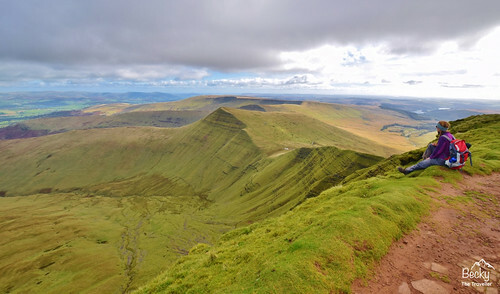 This is a popular day hike and has good paths taking you up to the top of Pen y Fan. As a bonus, you also get to summit the second highest mountain in south Wales Corn Du (873 m/ 2,864 ft) on the way up. And if you really want to go the extra (and another 3 km) you can hike down from Pen y Fan and up the next mountain Cribyn (795 m/ 2,608 ft) for some more beautiful views of Pen y Fan. I did the hike on a gorgeous autumn day and was lucky to have 360-degree views all around. The landscape is simply breathtaking and makes the hard climb all worth it. Although a very popular hike all year round, in winter after a heavy snowfall it can become quite dangerous. The paths are paths hidden by snow and it can be extremely cold at the top. Always be prepared and wear the right hiking gear and take a flask of hot drink. Mt Snowdon in the beautiful Snowdonia National Park is the tallest peak in Wales, UK. And if you’re anything like me, that title of “tallest” means, of course, it needs to be climbed. The ascent isn’t too difficult for a day hike and there are numerous routes to the top, with it being do-able by most people of reasonable fitness. Even my Miniature Dachshund with his very short legs made it to the top, with a little help! You’re more likely to experience difficulties with the inclement weather, after all, this is Wales or the crowds in summer. Ideally, visit mid-week or before or after the peak summer season. I climbed up the Pyg Track and returned by the Miners Track both lead to the same car park. My favourite views were just before the summit (from which the mist didn’t lift), with gorgeous views of the lakes below. Another highlight was the presence of a cafe at the summit, thanks to the train that also climbs the mountain, meaning that I could have a delicious hot pasty for lunch instead of my sad looking sandwiches. And whilst 12 km doesn’t sound that long, I was happy to get back to the car park at the end of the day and enjoy a pint of local beer or two, resting my sore feet. The Pembrokeshire Coast has miles of rugged cliffs and coastal paths that you can explore. One of my favourite day hikes whilst I was on my UK National Park Challenge was the section from Porthgain to Abereiddy. The hike can start or end in either place as there are car parks at both ends. Porthgain is an old industrial coastal port where quarried slate was mined. You can still see the old buildings in the harbour. I started my walk from here and headed south following the coastal path to Abereiddy. You don’t need a map as the path is obvious, although I always like to spot other landmarks on the way. On arriving in Abereiddy the highlight of the walk is arriving at the Blue Lagoon. The quarry walls were blasted allowing the sea water to flood in. 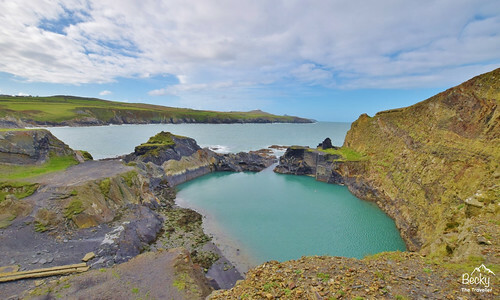 Now a popular spot for coasteering, famous along the Pembrokeshire Coast. Wales has some of the UK’s best day hikes. Picturesque views of mountain tops. Elevated lakes making for the perfect backdrop as you take a break from the hiking. One place not to miss out on in Wales is Snowdonia National Park. Filled with many hiking trails from short day hikes to some you can do over multiple days if you so wish. Cadair Idris lies at the Southern end of Snowdonia National Park close to the town of Dolgellau. Minffordd Path is a day hike that starts on the southern side of a mountain near the glacial Tal-y-llyn Lake. The trail route takes you along Llyn Cau, an elevated lake. Then along the rim of Craig Cau to Penygadair. Its 4.4 km/ 2.7 miles and involves two climbs of over 300 metres (980 ft). And the views of the lake are simply stunning. But with a little more height into the hike, you will be rewarded with even better views from the top of the hike before the descent down. Snowdonia trails have something for everyone and the hiking routes range from easy to the very steep and difficult as well as short and long trails if you wish to vary your hikes. You need to be able to read a map to navigate as some of the walking trails are not easily marked. Come prepared with food, warm and suitable outdoor clothing in addition, to a first aid kit and good walking shoes. Hiking UK: What to wear for a day hike in the UK? Ok, I’m going to say it now. The weather in the UK can change in an instant. Whether you are high up in the mountains or out shopping the British weather is known for creating plenty of conversation. In order to enjoy these best day hikes in the UK, make sure you are prepared for all weather. Yes, snow, rain, wind and sunshine. When you are hiking mountains you can experience all of these in one day so make sure you take your waterproofs. For a more detailed list of what to wear and what to pack for a day hike in the UK, click here to read my post on What to pack for a day hike in the UK. There are soooo many of these that i’d like to explore if/when we move back to the UK. Thanks Josy, thank you for sharing your lovely North Downs walk. It’s something I’m thinking about doing myself now! I love this Becky! I’m definitely putting some of these on my 2018 to do list ? Great list. We love Helvellyn and Striding Edge in the Lake District. Love your pictures, and wish I could come and make all these hikes myself. Beautiful.